Up ravines and over hills miners and merchants, soldiers and seamen scrambled throughout the area. By the summer of 48, more than a thousand men were working the ground at the new camp, which soon placed Coloma as the initial rendezvous for the Argonauts. But not all the newcomers were interested in gathering their share of the plentiful wealth by such back-breaking labor. Murders and robberies became frequent in isolated camps along the AmericanRiver, and before long, several merchants and miners had lost their poke of gold at knife point. After one such crime early in 1849, an impromptu citizens jury met to consider the fate of the three accused. The jury wasted little time reaching a verdict. Then the question was asked, What shall be done with them? Someone shouted, Hang them! The majority were in agreement. And so it was that the first known hanging in the Mother Lode that was carried out. The site was a giant white oak in the corner of hay yard near the center of town. The word spread quickly and Old Dry Diggins soon became known as Hangtown due to several other hangings. (It was called Dry Diggins because the miners had to cart the dry soil down to the running water to wash out the gold). Today, only the tree stump remains, hidden in the cellar of a bar on Main Street in Placerville named -quite aptly - The Hangman's Tree. Apparently, the evidence supporting the charges was sufficient to convince the State Legislature to settle the matter once and for all. 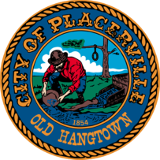 So, by an act of the Legislature, the county seat was moved to Placerville in 1857.